The mission of the Sagebrush Habitat Conservation Fund is to "protect and restore sagebrush habitat in the American West for native wildlife through voluntary conservation." buying and retiring federal grazing permits where authorized from interested willing-seller permittees on an individual basis and where permitted by law or regulation. acquiring property interests from willing sellers, including property in fee title, conservation easements, or other interests. leasing state or private land for wildlife conservation. working with other non-profit organizations, government agencies and others to fund comprehensive land protections for native wildlife. 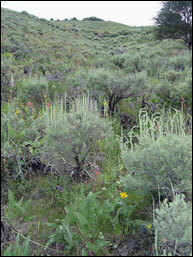 restoring native plants and water sources to benefit native wildlife. The Sagebrush Habitat Conservation Fund seeks to work flexibly and responsively with individual landowners or permit holders interested in voluntary conservation projects that fit within the Fund’s scope of work, and geographic areas of interest. To propose a project or make further inquiry, please contact us here. All inquiries will be held in confidence.